Quite regularly I hear requests that centre around wishing users a Happy Birthday within an organisation. 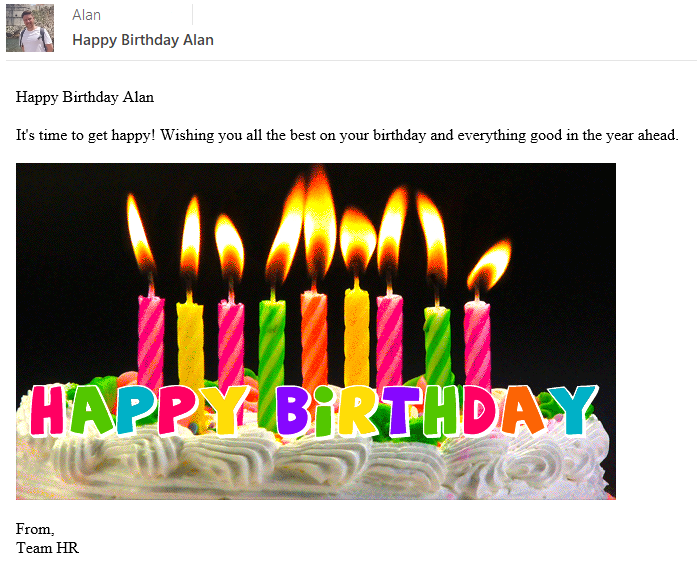 There is an extremely popular template within the Flow template gallery that does just that, it is called "Send a Happy Birthday email to employees on their birthday" and it uses a SharePoint list. It work's really well, although sometimes date formats can become an issue for the Flow implementer when they are imported from the list. Also, the organisation's users need to be added to the list itself in advance. Whilst that isn't a huge chore for most people, below is a process that requires no list and will send an email to every enabled user in your O365 tenant at 9am on the day of their birthday. Well, read on and follow the steps and you too will be able to implement this process. Your email will look like this. Pre-requisites: You will need a suitable Office 365 group. This may be an "All Users" group or a segmented group that only has users who have agreed to recieve such an email. Maybe it's a group that omits the CEO or those who may not celebrate their birthday. I will leave that to you to decide, but in this example a pre-configured "All Users" group is in use. Here is the complete Flow.